LONGS, SC - You know he's proud, when a golf course superintendent talks about his track with passion. Jay Nelson's enthusiasm for Crown Park is contagious! When asked whats special about your course, Nelson doesn't hesitate. We have approximately 200 acres of wooded area here. There are no homes or condos on the course. Originally opened in 2001 with 27-holes it has been redesigned as an 18-hole PAR 72 course and still retains its natural beauty. At just 6477 yards from the blue tees and 6004 from the whites, this course is not going to beat you up with length. However, that's not an assurance you won't be tested. This is definitely a shot makers course, Nelson stated. We have some very clever Par 4s with doglegs and the greens with their undulation are very challenging, Nelson added. Strategically placed doglegs and hazards test just about every shot. There is a generous amount of water, sand and swale hazards that come into play. Quite frankly, if you're hitting your driver more than 225 yards, you'll use it sparingly throughout the day. Bring you're 3-wood and long iron A-game. The length of Crown Park and the emphasis on shot making lends the course very senior and lady friendly. The TifEagle Bermuda Grass greens were in good shape on this day. Some courses in the area are choosing to paint their greens when they go dormant as opposed to over seeding with rye grass. Crown Park is one of those courses. The superintendent shared that rye is a cool weather grass. The unseasonably cold weather we've experienced in our area is not conducive to over seeding greens. Also, in April when good growing temperatures return, painted greens will return to a lushness quicker that the over seeded ones. That's probably more than you wanted to know about green maintenance. However, it's important to share that painted greens do not impact the quality of play one bit. In fact having played both painted and over seeded greens this winter, I do not have an issue with either. The advantages of a quicker return to natural lushness this spring trumps the deal for me. Crown Park is a very hospitable golf course. It's evident from the way the staff welcomes golfers. They are truly appreciative that the visitor has chosen their course to play. That friendliness continues on the first hole with complimentary fresh fruit and onto the turn at the snack bar. The pro shot is well stocked with reasonably priced logo merchandise. Both No.1 and No. 2 provide a good introduction to what awaits you. Relatively short, straightforward Par 4s, they require you leave the driver in the bag. A well-placed lay up in the fairway leaves a short to mid iron to the green on both holes. The Par 4 No. 3 hole at 376 yards from the white tees adds length, but demands the same strategy. Water comes into play on the left at 245 yards and the fairway narrows considerably. Your approach shot goes into a 25-yard shallow green with a hazard in the rear. This hole is deserving of the Number 1 handicap. No. 4 is the first of the very challenging Par 3s. Good length at 187 yards this green is guarded by a large sand bunker to the right and a small, but deep grass bunker to the left. The two tiered, undulating green slopes dramatically from back to front. A front right pin placement can create a real problem. No. 12 a dogleg right and only 335 yards was a favorite hole, but one that will test your nerves. Water to the right prompts a tee shot that plays a little left of center. Your second shot carries water and if it's left or long, you're wet. A large sand bunker protects the front of this shallow green. The length of the hole says birdie, but the shape of the green says two putts and be happy. No. 15, the last of the Par 5s is the best. This is a true three shot hole with a large sand bunker coming into play from just about every tee box. Your second shot will need to carry a waste area that crosses the fairway and land in a fairly narrow opening. The approach shot must come to rest on a narrow, but 37-yards deep green. The Crown Park signature hole is the Par 3, 18th. The tee shot is only 145 yards from the whites. Although your shot needs to carry water to a green protected by two front sand bunkers, it's the severely sloped green itself that presents the challenge. Shaped somewhat like a bowl, shots tend to feed to the center of the green. A back right pin position is hard to get a putt to the hole and just as difficult preventing it from rolling back to your feet. This is a fun finishing hole. 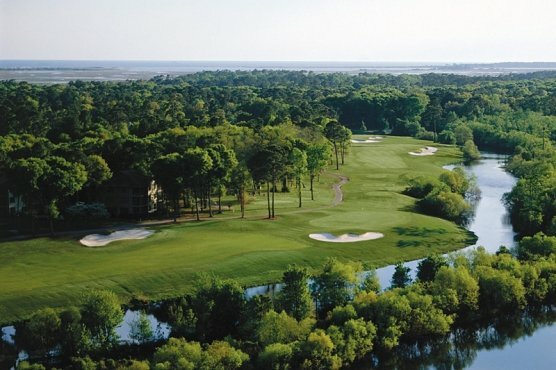 A short drive from North Myrtle Beach, plan to arrive early and take advantage of the practice area. Hit a few extra three woods and long irons. Take time to roll a few putts as well. You'll be glad you did. Crown Park Golf Club is the perfect venue for starting your golf vacation, or adding a second round to your day. The course will not overwhelm you. However, it will test you, encourage you to use every club in the bag and most importantly, you'll enjoy a nice day in a very pleasant setting.